An early June internal poll from Lankford’s campaign showed him leading Shannon, 41 percent to 34 percent. That’s a slightly narrower lead than an internal poll from a month before, when Lankford led 43 percent to 33 percent. The most recent surveys from Shannon’s supporters put him narrowly ahead of Lankford, 39 percent to 37 percent. But there’s a small shift from April, when a similar poll from the same pro-Shannon super PAC showed him ahead of Lankford, 42 percent to 32 percent. Rep. James Lankford headed into the final three weeks of the Oklahoma Republican Senate primary with more than double the cash on hand of his top opponent, state Speaker T.W. Shannon. According to pre-primary reports filed last week with the Federal Election Commission, Lankford had $732,000 in cash on hand as of June 4, while Shannon had $330,000. The two candidates’ fundraising totals in the pre-primary period, which covers April 1 through June 4, were closer. Lankford raised $847,000 and Shannon brought in $626,000. Lankford also outspent Shannon over that two-month period, spending $1.1 million to Shannon’s $798,000. SHANNON, LANKFORD NECK-AND-NECK HEADING INTO FINAL STRETCH OF OK SENATE PRIMARY"
Lankford entered the race when Coburn suddenly announced his retirement in January with a 37 point lead in the polls. But Lankford's top challenger, former Oklahoma House Speaker T.W. Shannon, has made a surprisingly strong challenge, climbing from a huge deficit to run neck-and-neck with Lankford in polls from this spring. Shannon served as the youngest Speaker of the Oklahoma House of Representatives ever from 2012 to 2014. While there, he established a strong conservative record as a fiscal hawk, supporting efforts to eliminate the state's debt by selling off unused state assets. He has continued in his Senate campaign to support classic conservative positions. Shannon's limited government message has garnered the support of a host of national Tea Party groups--including the Senate Conservatives Fund--as well as some high profile Tea Party favorite politicians. Sarah Palin, Mike Lee, and Ted Cruz have all endorsed him. Recent polls show Lanfkord and Shannon in a virtual tie--both poll in the mid thirties. Should neither candidate receive the 50 percent plus one required to win the June 24 primary outright, the top two candidates are expected to face off in an August runoff. A third candidate, former state Senator Randy Brogdon, is also on the ballot, but his support has dropped to single digits. The Sooner Poll, conducted May 5 to May 8, showed Lankford leading Shannon by a 33 percent to 31 percent margin. With a sample size of 580 and a plus or minus four percent margin of error, the poll shows a virtual dead heat between the two. On Wednesday, Sarah Palin said, "Grassroots commonsense conservatives can use this momentum [from the Dave Brat victory] to push good candidates like Chris McDaniel, T.W. Shannon, and Rob Maness to victory for America. These candidates are also being massively outspent by establishment candidates and they need our help and energy." There could be no greater indication of the political power of Sarah Palin than the remarkable polling history which seemingly indicates that, from nowhere, and against tremendous odds, the election of Oklahoma's T W Shannon as the state's new senator is looking more than possible. Shannon, described as a very conservative former speaker of the Oklahoma house, has overcome a polling deficit that would have made most candidates give up before they started. No doubt his personal reputation, his compelling story of being a Black conservative, and his wife's story of overcoming health problems have assisted his recent rise greatly, but there can be little doubt that the same factor which advised now Senator Ted Cruz to state publicly “ I Wouldn't be here if it were not for Governor Sarah Palin, was at work. "Tom Coburn leaves large conservative shoes to fill as he retires from the U.S. Senate. At 6’5 feet tall, T.W. Shannon is just the leader to fill them," Palin wrote. "T.W. is the underdog in his race, but that’s not a position he’s unfamiliar with." Palin wrote that Shannon, the youngest and one of the most conservative Speakers of the House in Oklahoma history, has "had to beat the odds all of his life" to eventually become "the first Republican to ever win his district’s seat in the Oklahoma state legislature even though the naysayers said it couldn't be done. When he sought to be Speaker of the House, the naysayers said he was too young and too conservative to win. But his colleagues chose him anyway, and he became the youngest Speaker in Oklahoma history!" She said while Shannon's opponent has the "backing of Beltway insiders," Shannon has "the passion and experience We the People need in Washington. As the former Speaker he can stand proud on his record of fighting for conservative legislation that directly benefited the lives of Oklahomans by lowering taxes, cutting government waste, and breaking the cycle of poverty by encouraging entrepreneurial self-reliance as the proven path to prosperity." "We are suffering from a lack of conservative vision. I believe we desperately need leaders with deep convictions who will fight—and win—the battles for conservative policies," Shannon told Palin, who wrote that "We can also rest assured that T.W. will bring to D.C. the integrity and moral compass he acquired growing up attending Bethlehem Baptist Church and teaching Sunday School." Conservative Oklahoma Senate candidate T.W. Shannon has opened up a 10-point lead after trailing Rep. James Lankford (R-OK) by 35 points just two months ago in the race to replace retiring Sen. Tom Coburn (R-OK). That represents a net swing of 46 points in Shannon's favor.The poll found that Shannon leads Lankford 42% to 32%, and 63% of Oklahomans view Shannon, arguably the most conservative Speaker in the history of the nation's reddest state, favorably, as opposed to 6% that view him unfavorably. In February, 30% of Oklahomans viewed Shannon favorably while 4% did not." Next Polling round of non-partisan pollsters found Shannon and Lankford both in a virtual tie well within the margin of error with the lead swapping back and forth within that MOE. Shannon's consistent 32% in non-partisan polling represents a 14 point increase from his first poll and a nett 34 point turnaround in the race. Campaign items can bring some of the passions,excitement and color that the usual media can't quite express. Buttons show what images of the candidates their teams thought had best impression making and, quite interestingly, what slogans resonated best with supporters and the wider public. In fact a study of a campaigns buttons can often show the progress of slogans for example, in the McCain buttons "Country First" clearly starts off as the main theme and then "Experience Counts" becomes a major theme as the campaign progressed. The McCain-Palin campaign of 2008 had some unique aspects. Having the first female GOP Vice-presidential candidate for a start. Palin is unique in VP campaign ephemera for having a mass of buttons dedicated solely or mostly to her, about 120 supportive alone at current count. There are, which is absolutely unique, a mass of anti-Palin buttons which shows the genuine concern about her from the Democrat campaign and also the very real passions her campaign brought up. In all presidential elections in American history I can find, after extensive research, only 13 campaign buttons attacking a vice-presidential candidate. The earliest images date from 1968 with two attacking Nixon's running mate Spiro Agnew. It would appear that from George Washington to Lyndon Johnson no VP candidate was considered worth attacking and in this manner, and since LBJ, only about a dozen attack buttons were reproduced-that is until Sarah Palin was picked as John McCain's running mate in 2008. I reproduce below the, so far fifty five 2008 buttons attacking Governor Palin-four times the number of buttons attacking every VP candidate in the entire history of presidential campaigns on the evidence too date. There have been a considerable further items produced in 2012 simply for the possibility she might run for the presidency in that year. The left, the Democratic party and their supporters in the main stream media, Blogs and journals have been relentlessly pushing the supposed "Republican war on women" meme which is gathering momentum in view of the presumed presidential run by Hillary Clinton and some extreme statements by a small minority of GOP candidates. That such a campaign is the height of utter hypocrisy is clearly seen by the unprecedented war on Governor Palin by all those aspects of the left. How such blatant hypocrisy can be presented to the public is a mystery which can only be solved by viewing the lefts adherence to the truth as something of a myth. A glance at the vehemence, hatred and frankly disgusting misogynism at play in these campaign images would be enough by itself to explode the leftist Alinskyite campaign. If the left shouts "Republican war on women" then the simple counter is "Democrats five year war on Palin" and referring them to these images. These images are of course only a tiny part of the massive campaign that was, and still is, waged against Palin. Apart from buttons there have been disgusting T-shirts, costumes banners, pornographic videos, poster against her and her family. There can be only one reason for this campaign of hate against someone the left calls "irrelevant" whilst waging unrelenting hatred against her and that is, surely, that she is seen as a threat. The media was massively invested in Barack Obama, and the shock of Palin's 2008 vice-presidential nomination speech at the GOP convention set the left off in a frenzy never seen before in the history of a presidential campaign. 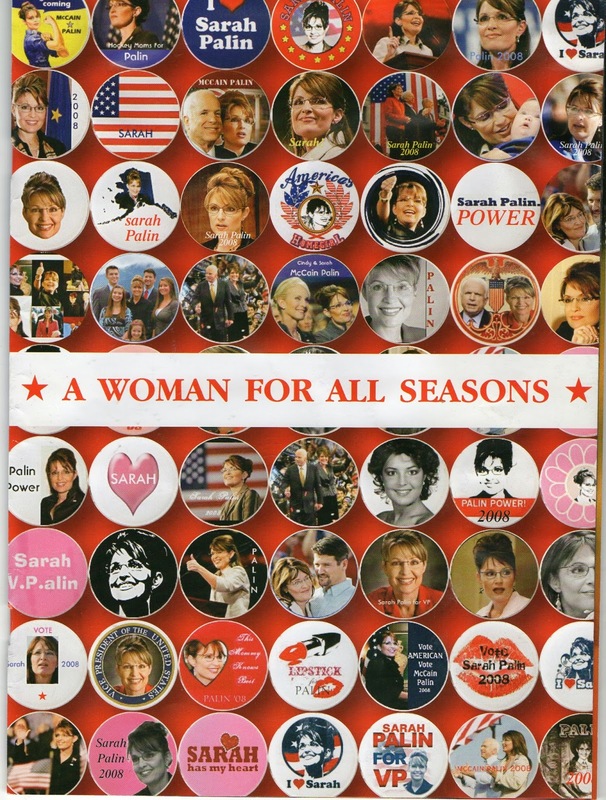 The images below, which range from a mad Palin baying at the moon, to a button so biased (a recent "Whities" button reproduced below) that it was only done in a limited edition with examples selling at auction for $261. Palin is depicted, variously, as a vampire, a madwoman, a cannibal, a "cougar" and a pig amongst numerous other aspects of the fevered leftist imagination. Here is the true imagery of the "war on women" and it is a collection of hatred which should shame any decent Democrat and shows the feminist left, who did nothing to stop it, in their true, biased light. "This 4 inch celluloid by Brian Campbell has stirred up some controversy. One of just 27 made." Apart from the usual methods of researching past presidential campaigns, old newspapers and videos of television adverts and speeches the buttons and badges, flags and banners and all the other campaign associated ephemera help to give a broader overview. There are an army of campaign button collectors with their own conventions and magazines and serious avenues for campaign items exists at various museums and universities.